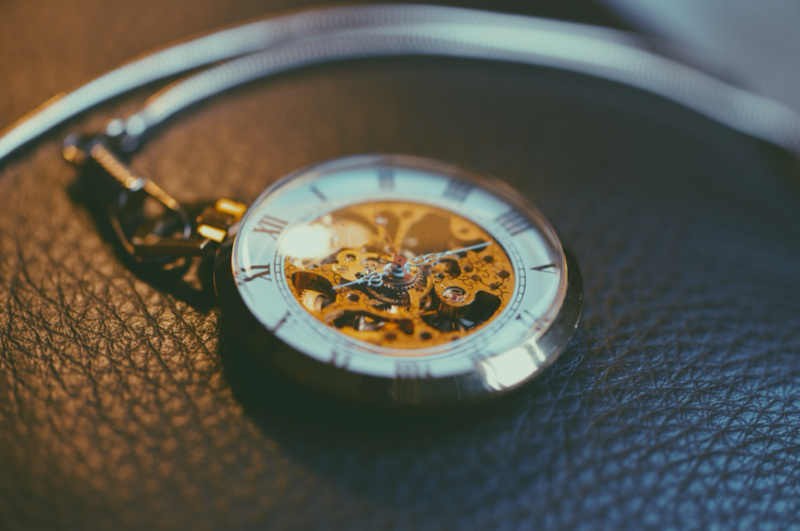 Is time valuation more important than time management? In the chaos of modern, fast-paced living, it often feels we don’t have enough time for… well, anything. Time is of the essence, time can be well spent or wasted, time is money, time is valuable, time is ticking, and above all else — time flies. If only we could manage our time efficiently, we’ll have all the time in the world and achieve all it is we desire time after time. Modern convention says time management is absolutely essential to keep track, to help achieve our goals. Not so fast, though; I’m going to argue time management is secondary to something more important — time valuation. This approach is less focused on the physical act of scheduling in a journal or diary. Instead, the focus is the abstract, mental visualisation of how each of us perceive future time. Entries in a diary within themselves aren’t stressful, but the way we perceive our timeline of upcoming events often leads to stress or anxiety. Let me begin by explaining my distinction between time management and time valuation. What Is Time Management And How Can It Cause Stress? Time management is a way of managing and arranging the things we need to do into the time we have. I visualise this process as a calendar in our mind’s eye. The things we need to do are entities we attempt to fit into this mental calendar, from the important (go to work, pay bills) to the not-so-important (take the bins out, shower, tidy room, organise internet bookmarks) — and everything in between. These are usually a mixture of physical entries in a diary and mental notes floating around in the recesses of the mind. However they are stored, stress arises when the things we need to do don’t comfortably synchronise with the time we have. The square peg, round hole approach is a recipe for stress due to a number of problems with the process of assigning the things we need to do to the time we have. It can apply to any time period: the next hour, day, week, month, year, or even lifetime. Fortunately we can train our brains and take control of this process, making it serve us effectively in both pragmatic planning and emotional ease. Before understanding how to take control, I’ll highlight the problems with the square peg, round hole approach. Becoming aware is the first step in making change. Humans are notoriously bad at mentally perceiving time. Not so much the rationalisation of “it’ll take me 30 minutes to exercise,” but more the experience of time. Time’s nature is one of life’s greatest mysteries; it’s heavily subjective, illusionary and is influenced by the context of events. This is understandable as our brains lack the pathways to process temporal information. Now the process of time management has a few deceptive layers. I have an attempt to synchronise the things I need to do into the time I have, with an erroneous belief of how much time it takes. This leads to another mistaken belief — the only way to do what I want to do is get more time. Yet time isn’t a commodity, something to gain or throw away, so I have tricked myself into believing there simply isn’t time to write a book, and consequently writing a book is a fanciful, impossible dream. 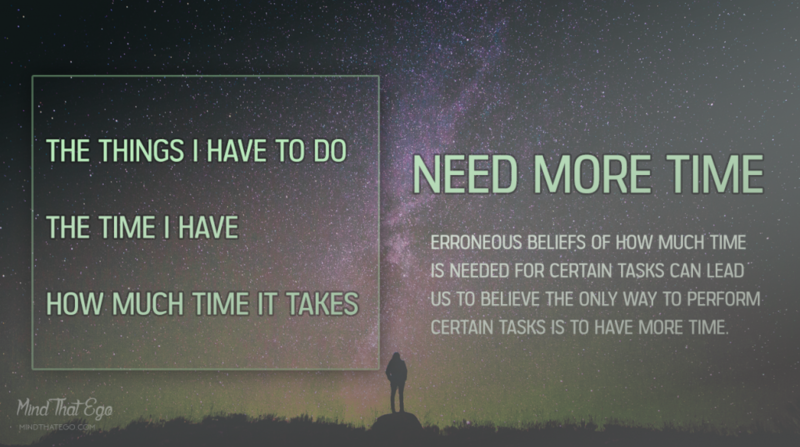 Erroneous beliefs can lead us to think the only way to perform certain tasks is to have more time. Zauberman’s study could be significant in understanding how the above limiting belief of not having enough time is formed by memory and perception of past attempts at achieving goals. If we live our lives taking the square peg, round hole approach and not pursuing our passions or desires, we can become stuck in self-fulfilling cycle of lack of time. We perceive time as flying by, as limited. We project this erroneous belief into our mental calendar and can’t find space. Writing a book becomes a write off. What this common mistaken belief is really saying is: “If I’m not being productive, my time is wasted.” As Tolle points out in the above quote, this is a fallacy. Time isn’t precious, but each waking moment is. Yet we’ve been taught to value the concept of time, the idea of a blissful future where all our materialistic dreams are fulfilled. This is an important element of time management and our perception of time — we live in an economically-driven, materialistic society that deems “productivity” as valuable, because it contributes to economy, and thus its agenda. Society does not value being because being is the antithesis of this agenda. There are a number of forces at play here. Culturally, we assimilate the idea that a) time is valuable and it cannot be wasted and b) there is a hierarchy of productivity (thus value) framed by economically-driven principles. The number one principle for productivity is spending our time in a way that makes money. Other values closely linked include achievement, framed within itself to essentially mean career success, and material gain (get the house, get the car, get the iPhone X). You could argue escapism, and hedonism, cunningly weave their way into this value system as a means of “switching off” from incessant productivity. Productivity has become an addiction. We strive to be more productive, with the aid of modern technology. We strive for motivation, the elixir or productivity. We’re productive at the cost of our mental health and wellness. We’re even transforming mindfulness into a tool to make employees more productive at the workplace. All this leads to most of us feeling a noticeable twinge of guilt any time we aren’t productive. But it’s important to remember it’s all a matter of perspective. Time spent “not being productive” is framed that way because of societies hierarchy of values. When we abide by the value society gives time, and money-centered productivity, it means we value other pursuits as less than. Doing nothing is a cardinal sin, the epitome of not being productive. Taking time to reflect. Doing for the sake of doing. Being for the sake of being. Writing. Painting. Walking. Playing. Resting. These are noble pursuits that nourish the soul — yet they do not hold much value in the hierarchy of productivity. Core needs: eat, sleep, pay bills, shelter. These are essential to survival and are naturally high value. Hierarchy of productivity: entities linked to the hierarchy of productivity are a close second. Making money, striving for success, moving forwards, career progression. These are future-based and attainment-based, thus making the future more valuable than the present (Tolle rightly refers to this notion as insanity). Escapism: we are social animals — socialisation is a core need. But there’s emphasis in modern times to always be seen as having fun, escaping, creating Instagram, Facebook ready “moments.” During alone-time, escapism may include binge-watching Netflix or digesting social media. This form of escapism encourages a lack of self-reflection, self-insight and consequently self-actualisation. Doing stuff or “busyness”: doing nothing is low value, so many of us fill our time rushing from one thing to the next, doing stuff to avoid doing nothing. Again, these categories are far from exact science, but they hopefully provide an idea of how the motivating factors behind the mental process of assigning the things we need to do into the time we have. Let’s return to the book example to clarify. I start the process of time management by attempting to assign the entity write a book into the time I have in my mind’s eye. This process encompasses a flawed perception of how much time it takes. During this process, conflicting values will fight it out to see where write a book can fit. The values I assign to write a book may include fulfilment, satisfaction, creative expression, and so on. However, in a value system based on society’s values, these rank poorly. In a Top Trumps standoff, fulfilment, satisfaction, and creativity can’t match making money, doing stuff, and even plays second fiddle to fun or escapism. I’ve lost count of moments in the past where I’ve planned to get up early and write, only to choose to get drunk the evening before and sleep in. If we don’t consciously apply value to the things we need to do, those values are set for us. If we simply attempt time management, the process is dictated by the hierarchy of productivity and external values fitting the agenda of an economically-driven society. Once aware of this process, the antidote is to empower ourselves by setting our own values. This transforms the process in a way that serves us. Back to the book example; if I consciously set this at high value and understand the process of time management, the process of assigning the things I need to do to the time I have changes. Instead of trying to fit a square peg in a round hole, I trim the edges and make the square a circle. Write a book becomes high-value, beating other categories such as doing stuff, escapism, and even the hierarchy of productivity. The process of assigning the things I need to do into the time I have becomes a conscious, creative, and fluid activity. 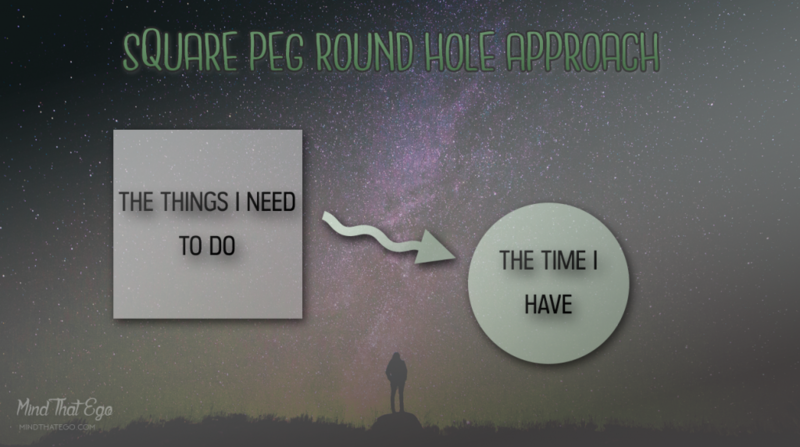 The square peg round hole approach to time management. I’m not advocating irresponsibility. Meeting core needs and gaining financial income to provide security and shelter are necessities. Socialisation is a necessity to the extent of keeping our relationships, sense of connection and intimacy healthy. Escapism is necessary at times, as long it doesn’t become a habitual avoidance technique. Balance is key. But if we can incorporate the conscious time valuation, imagine the difference when assigning the things we need to do into the time we have. Writing a book has transformed from a task that takes lots of time and doesn’t fit the time we have, to becoming a concrete addition to the mental calendar, immovable, valuable. An additional bonus is that high-value entries become solid entries in the mind’s eye, not featherweight entries easily blown by the wind of outside influence. Let’s use exercise as an example. Take three people: Person A regularly works out multiple times per week. Person B enjoys exercise and understands how important it is for health, yet never gets more time to go to the gym or run. Person C doesn’t value exercise. Person A has consciously placed high-value on exercise, so exercise becomes a solid entry in the calendar of their mind’s eye. When undertaking the process of assigning the things they need to do to the time they have, exercise ranks highly. When looking at the time they have, Person A sets solid entry for exercise, three times per week, and always manages to “make time” for it. Person B, though clear on the value of exercise, hasn’t consciously assigned it higher value than external values. They may be unaware they are influenced by the perceived value of busyness, escapism, the hierarchy of productivity. They take the square peg, round hole approach and always struggle to get more time for exercise. When exercise is successfully scheduled, it is low value, and easily replaced by other events. Person C doesn’t assign value to exercise. It’s not even an entry on the things I need to do. But what happens if Person C develops diabetes or suffers a heart attack? Exercise enters the things I need to do. Depending on the person’s desire to improve their health, they may then end up in the same situation as Person A or Person C. They either consciously place high-value on staying well, or struggle to get more time as exercise plays second fiddle to external values. Consciously assigning value can transform the way you assign the things you need to do to the time you have. This transformation leads then to a more fulfilling, relaxed, rounded and balanced use of the most precious thing you have — not time, but the present moment. My name is Jimmy and I am the content manager for My Speed Reading which is a speed reading website. I have been exploring reading and educational courses websites and came across your site end read “Time Management Isn’t The Solution To A Stressful Schedule, Time Valuation Is”. I was wondering if you ever have guest bloggers contribute to your site? If so, would love you to consider a piece of mine. I have a few banked up as yet that I could share with you, or if you have a particular subject you may want written on I am more than happy to research it and write one for your website (free of charge; I do not expect payment). I am a speed reader myself and am extremely passionate about the field of speed reading.